Recent y-DNA test results for some Skye MacPhersons, including families described on this website, clearly show a link to the line of Iain Ban McPherson, celebrated as the commander of MacDonald forces in the last clan battle on Skye (about 1601), when the MacDonalds bettered the MacLeods in the shadows of the Cuillins above Glenbrittle. Iain Ban himself came from a line of men who had been hereditary standard bearers to the MacDonalds of Sleat, including the original bearer of that office, the Red Parson (Pearsainn Ruadh) . It is not known whether our families' branch separated from the line before or after Iain Ban. "The history of my predecessors is shortly this:- They followed the Macdonalds of Sleat and their fortunes when that line of Princes of the Isles came to Sky. Our caste were the hereditary Standard bearers (the Ensign a bush of Heath) of the family: and we had free lands in Sleat for that service. The last who exercised this office was Ian Bane MacVorstin who commanded the Macdonalds at Blar i Chullin, the last fight fought between the Macleods and the Macdonalds...."
".......the predecessor of Ian Bane MacVortsin who made most noise in the story of our family was the Pearson ruagh [Red Parson]...Tradition stated that the predecessor who followed Hugh of Sleat to Sky, had 30 warriors: and our little clan could muster in Sleat, when I was a boy, the same number..."
[Full transcript on Library Page or click here]. In about 1469, Hugh MacDonald received a grant from his brother, John, 4th Lord of the Isles, including Sleat in Skye, but this was contested by occupying MacLeods "..between 1469 and 1493, Skye was invaded by dissident and land-hungry MacDonald cadets, among them probably Hugh accompanied by the Red Parson (Pearsainn Ruadh) and his thirty warriors, whom he established in Dunile (OS Dun Ela at Ostaig)..." [Professor Alan G. Macpherson, honorary historian to the Clan MacPherson, Article in Creag Dhubh 1971, p451]. 'Dunile', on the shore near Kilmore, Sleat, is taken to be Dun na Fear Ileach, "The fort of the Man of Islay." This was the origin of Clandonald North, or Clan Huistean Macdonald of Sleat. Professor Alan Macpherson believes that an authentic history for the Red Parson is contained in a 17thC manuscript written in Sleat by Hugh MacDonald. This claims that a grandson of Donald of Islay (from whom the Clan Donald took its name) named Angus og McDonald, Lord of the Isles 1300-29, married a daughter of the chief of the O'Cathans or O'Kaines of Ulster. According to Hugh MacDonald, her tocher, or dowry, included "seven score men of every surname under O'Kaine", among them 24 chiefs who became heads of clans of Scotland. They included "the MacPhersons, who are not the same with the Macphersons of Badenoch", but are of the O'Docharties in Ireland. Alan Macpherson speculates that Angus Og met his wife in Ulster assisting Edward Bruce's invasion of Ireland, in the year after Bannockburn (1314) at which Angus had led the Islemen for Robert Bruce. Angus returned to Islay with his wife, whose retinue included the O'Docharty ancestor of the Red Parson. In support of the O'Docharty connection, Alan Macpherson, notes that the only O'Docharties recorded in Scotland, prior to the later Irish immigration, were in Islay [but of equal significance perhaps, as pointed out by Alastair Macleod, former Highland Council genealogist, are the MacDonald rental records of tenants Ferquhar Oddacharty and Kenneth Diodiarcharty in Sleat in the 1730s]. So Skye MacPhersons, or at least those of the Red Parson's line, have a different history to the bulk of Clan Macpherson, and a very different y-DNA profile. However, as it was not uncommon for folk to come under the protection of a clan of a different name (and often change their name to that of the clan), Skye MacPhersons could come under the banner of Clan Macpherson. However, given their history and geography, it can be argued that they were more closely associated with Clan Donald. 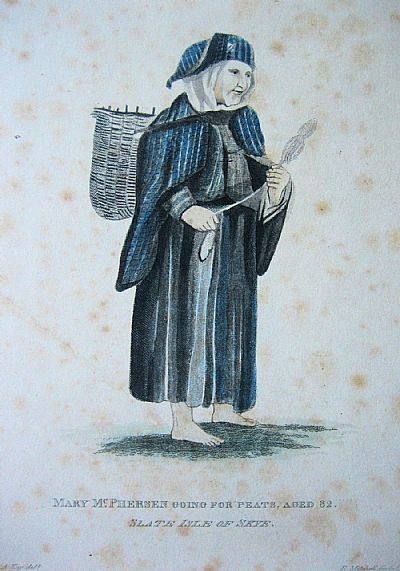 This image, "Mary McPhersen going for peats, aged 82, Slate Isle of Skye", was made by Alexander Kay, artist, and Edward Mitchell, engraver, Edinburgh. It was produced about 1811. There is no evidence that she was related to the MacPhersons of this website, but she surely would have been known to them.